I don’t think I really hyped it up much, but I got myself an Android phone a few months ago. 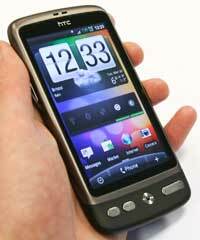 An HTC Desire, to be specific, and I love it. What I especially love is the apps, and that if you’re not happy with the defaults, you can probably find something else. This includes the keyboard; how many times do you have an opportunity to replace your keyboard for free? I wasn’t super-impressed with the HTC default keyboard. I was especially having issues while in a moving vehicle or on a bus. So I’ve been looking for a new keyboard application other than the default HTC keyboard. First, I tried ThickButtons and was pretty happy with it. The significant feature is that it determines the most probable keys that will be pressed next and makes those keys thicker (more easily located and pressed). It didn’t seem as good at predicting my text as the default keyboard. And I found myself mis-typing sometimes, because the keys were no longer in the same place. But after using it a while, it just didn’t seem much better than the default keyboard. Second, I tried 8pen. I’d really recommend visiting the link, watching the video and then coming back to read this. It’s really challenging to explain how the 8pen keyboard works, but suffice it to say the learning curve is a little steep. I appreciate the developers’ desire to create a functional keyboard while re-imagining the task of typing from the very basic concepts. I’m just not convinced that I’m ready for it. In finding a better keyboard, I didn’t really intend to find a whole way to type. I went back to the default for a while, but Thursday morning I got an email from Swype letting me know that I had been accepted to the Swype Beta testing and could install Swype on my phone. Swype was originally available for a limited period a few months ago, but has since only been available if pre-installed on your device. Now it’s available in a beta version that I’m quite happily testing. (I wrote this paragraph on the Swype keyboard on my phone.) Like the 8pen keyboard, there’s a bit of a learning curve, but mostly just getting accustomed to dragging your finger across the keyboard instead of typing. Hunting and pecking is a little more challenging, because hesitating tends to spell unintended words. Other than “spell”, I haven’t had too many problems (it kept coming up as “spiel”), although double letters seem to cause a few problems. So far, I’m sticking with it. If you’re in the market for a new texting, touchscreen keyboard, I would suggest trying a few of them before settling on one. I can guarantee that my experience is not necessarily yours, and neither are my issues. Have you tried out different touchscreen keyboards? Any thoughts or suggestions? This entry was posted in Technology and tagged 8pen, smartphone, Swype, ThickButtons.